Among earthquakes, tsunamis, and ridiculous heat waves, typhoons are just another part of living in Japan. A couple of weeks ago, we were preparing for what was predicted to be the strongest typhoon to hit Okinawa in 13 years - Typhoon Bolaven. With wind gusts being reported as high as 170-180 mph, even the Okinawans were preparing. And if the Okinawans are nervous, we know it's serious! After a week of anticipation, Typhoon Bolaven decided to grace us with its presence on a Saturday. For most of the day, it just seemed like an ordinary typhoon. However, it grew stronger and stronger as the day went on, and by late Saturday night, it was truly scary outside. And it was difficult to fall asleep - it literally sounded like a freight train was roaring past our windows all night! It is incredible how strong the wind can be. Making it through the night, the typhoon raged on for the next day, and even went into Monday - giving us all a day off of work! - until it eventually puttered out that evening, and we were allowed to leave the house! 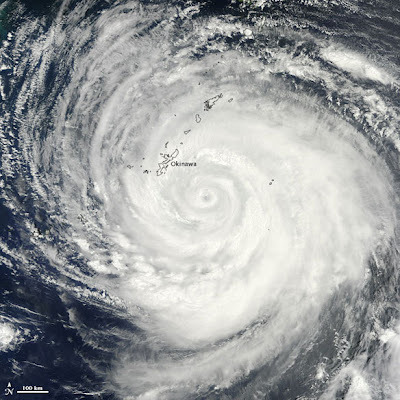 Satellite image of Typhoon Bolaven... we look so tiny! What our seawall looked like the morning after!